My favorite cafe... An outlet at every table. The cafe looks like it could be in Prague or Paris. I think I could just move right in...if the coffee matches the atmosphere. He is exploring his I-Phone along with many "toy" cameras. The results are cool. Hi... you don't know me, but I am a frequent visitor of Sharon, and a fan of your photos. 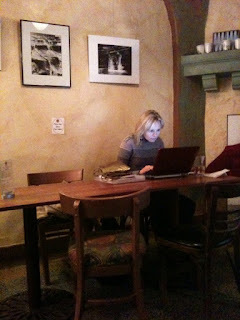 I have been looking for a cafe near Sharon with outlets and internet access. May I ask where this cafe is located? It's Fuel in Great Barrington Mass. Try Irving Farm in Millerton NY - much closer to Sharon. Wi-fi and a few outlets.